Shopping regularly is encouraged by high street brands with their lightening-fast seasons, trend based clothing, and endless sales but this only helps support and contribute towards the negative impact fast fashion is having on its workers and our environment. Using shopping as a quick-fix hobby will burn through your money unbelievably fast and it's not at all conducive to being more fashion conscious or stylish. 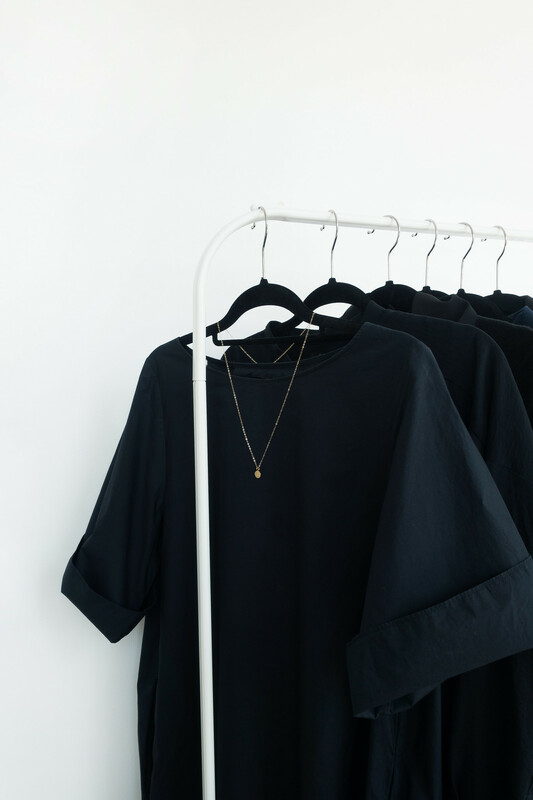 Endlessly buying new items means your wardrobe quickly becomes a mess of clothes you wear once or twice and then lose among the hangers; a wardrobe that no longer reflects your personal style or works in harmony with your lifestyle. It can take some time to ween ourselves off the habit of shopping as a hobby. Boredom, tension, frustration, celebration, or the need for socialising can encourage us to go outside and shop. It's a habit that produces a short-lived rush of excitement from the thrill of buying something new; it's a quick-fix pick-me-up that doesn't last. Buying less feels overwhelming when we're been taught all our lives that shopping is a stress relieving leisure activity and placing quality before quantity feels complex and impossible in a world of major chains and big name brands. Yet when we do, it helps us place more value on the things we do choose to buy and allow into our lives. If you're finding it difficult to change your shopping habits and shop less, here are a few tricks to limit your spending, break the shopping habit, and save you some money. Shopping online-only is a good way to break the cycle of shopping for fun; if the shipping costs don't put you off then the hassle of returning ill-fitting clothes or inadequate products might. In any case, shopping online-only provides a way of training ourselves into thinking before we make purchases. There's quite a lot of opportunity to change our minds and back out of a sale, unlike shopping offline where we're encouraged to buy now and regret later. If there are specific brands you're always tempted to buy from because their sales newsletters drop in your inbox or their feed is full of "great deals" and "super savings" - unfollow and unsubscribe. Digitally declutter your social media and inbox to create an environment that encourages conscious shopping instead. Saving money is great when it's on purchases we were going to make anyway but we often approach sales as if we're saving money and not spending it. If you bought a product in the sale you didn't need then you're wasting money regardless of how much it was discounted. If every time you had paused to think things over before purchasing a piece of clothing that was "good enough" but not "just right" how much money do you think you would have saved? Impulse purchases can be completely avoided by thinking things through; there's a lot to be said for waiting it out and seeing how we feel about that dress or new pair of shoes the next day, chances are we won't be quite as obsessed over them once we've slept on it. If you feel that overwhelming sense of urgency to buy something right away, add it to your wishlist or even the shop's cart and click away from the site. Are you still thinking about it in two or three hours time? Probably not. Wishlists make impulse purchases almost entirely non-existent if you stick to the simple rule of checking it pre-purchase. Filing all your wants together in one list provides a little perspective when considering whether to buy that dress you only just saw or the jewellery you've been eyeing up for months. It's all too easy to feel the pull of buying something new and exciting when you've only just discovered it, but a wishlist keeps that all in check and makes sure you're investing in pieces you've been in love with for longer than five minutes. Independent small businesses tend to cost more to shop from because you're paying for quality and craftsmanship, the true cost that major retailers can knock down to "bargain prices" because they can manufacturer cheap products in large quantities, and don't pay their workers a fair wage. By shopping small, buying handmade, and supporting independent businesses you will be voting with your money for fairtrade, high quality products, workers-rights, and craftsmanship instead of personality-less conglomerates.